Send the best gourmet wine gift. Our traditional wine gift basket of one bottle of select red or white wine is accompanied by an assortment of fine gourmet foods in a lovely basket. 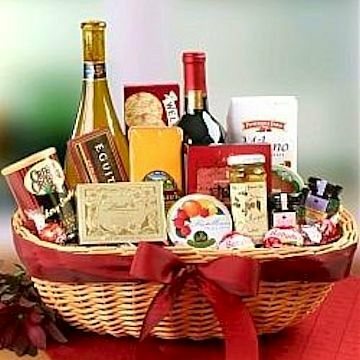 Gourmet foods include hand selected items from celebrated specialty shops beautifully appointed in a classic gift basket. A variety of crackers, cheese, nuts, confections, savory snacks, teas, or coffees will be included. Each basket is a one of a kind creation designed to impress the eyes, warm the heart, and please the palette.